Finding an accommodation that fits the lifestyle and budget bracket and at the same time that satisfies all the desires and needs of the international students is a very difficult and mind-numbing task. The students can always choose to settle in the on campus accommodations provided by the universities but the number of applications for the accommodations usually exceeds the number of rooms to be provisioned. Yeah, the on campus accommodations are convenient but at the cost of one’s privacy and liberty. Therefore, the students can always opt for off campus accommodations that not only satiate all their demands and needs but also respect their privacy and freedom. But, the question is how one can decide on an accommodation from all the numerous options available? Therefore, considering all the needs and desires of a student we have divided and filtered the student halls, studios and apartments into cheapest, value for money and luxury at its best for the optimum convenience and benefit of the students that would suffice all their requirements. Buchanan View is the cheapest en-suite and has a great social community with its own common room and secure onsite parking. Students choosing to book this accommodation will benefit from flexible payment terms, option to stay over summer, high speed Wi-Fi, contents insurance and an on-site maintenance team.  It’s a 4 minute walk to the nearest bus stop while the city center is just 6 minute ride away.  Glasgow Caledonian University is 1.2 kilometers away.  Glasgow school of Art is 1.01 kilometers away.  University of Glasgow is 2.5 kilometers away.  University of Strathclyde is around 0.6 kilometers away.  Royal Conservatoire is also just 0.6 kilometers away.  Within a short walk one will find Glasgow Caledonian University along with local amenities such as a post office, supermarkets and banks.  You can spend your weekends perusing the latest fashions in Buchanan Galleries mall, or enjoying the ever-changing exhibitions at the Gallery of Modern Art.  Bread Meats Bread is your go-to for award-winning burgers and bacon chips, while Bar Bloc offers craft beer and live music within a few minutes walk of Glasgow Film Theatre.  The Station Bar is located across the street where you can sit down with your friends and enjoy a few drinks and good music making it perfect for short breaks from books.  Le Bonne Auberge is also located across the street and great if you are looking for some quiet time with your friends. You can enjoy great French-style cooking and a break from cooking once in a while. Merchant Studio is the cheapest studio apartment with fully fitted-studio and study space. 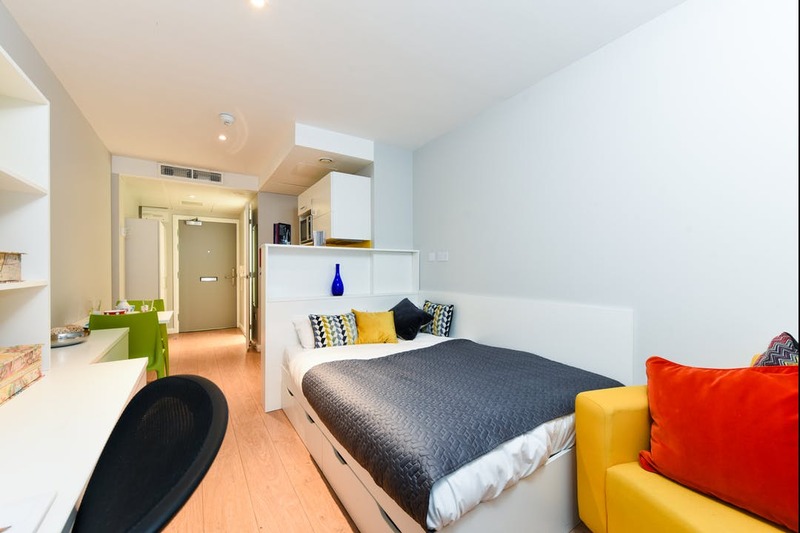 Each studio apartment has a small double bed, plenty of work space and storage, an own sparkling en-suite shower room and stylish kitchen and dining areas. All of their studios are priced per room and this doesn’t change if they share as a couple. Students can hang out in the spacious social areas, mingle in the contemporary coffee lounge or get your head down in the quiet study room. Students also benefit from 50 Mbps WI-FI, all utility bills included, flexible payment terms, free content insurance and 24 hour security.  Students will be at the University of Strathclyde, including its new Technology & Innovation Centre, and the City of Glasgow College in 5 minutes. 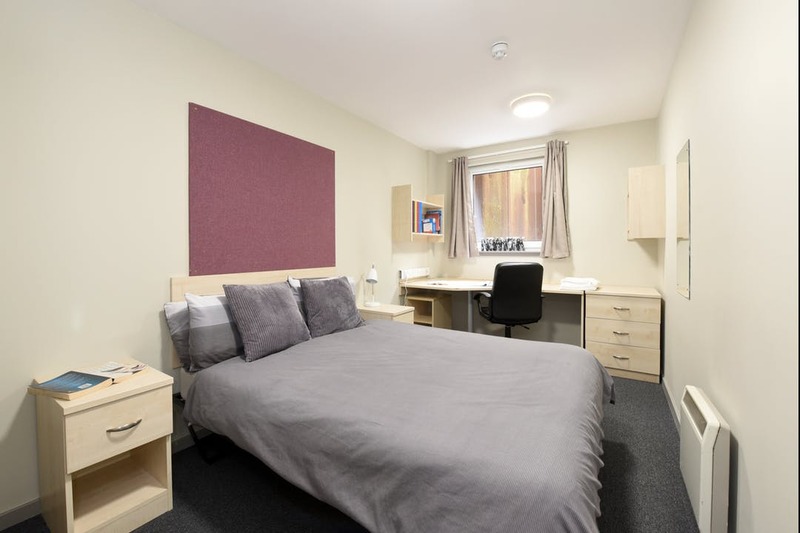  Caledonian University is 15 minutes walk away.  It just takes 15 minutes to reach University of Glasgow via public transport.  Walk down to the Blackfriars Bar and enjoy the bright mood and rotating beers here with your friends. It makes for a great mid-week break.  The Scottish Football Museum is also just 15 minutes away in a public transport. The Museum explores and focuses on the unique football heritage of Scotland. So it is definitely worth a visit for all sport fanatics. Gibson Street is the best value for money accommodation in terms of location. Students will also benefit from flexible payment terms, option to stay over summer, high speed WI-FI, contents insurance and an on-site maintenance team. 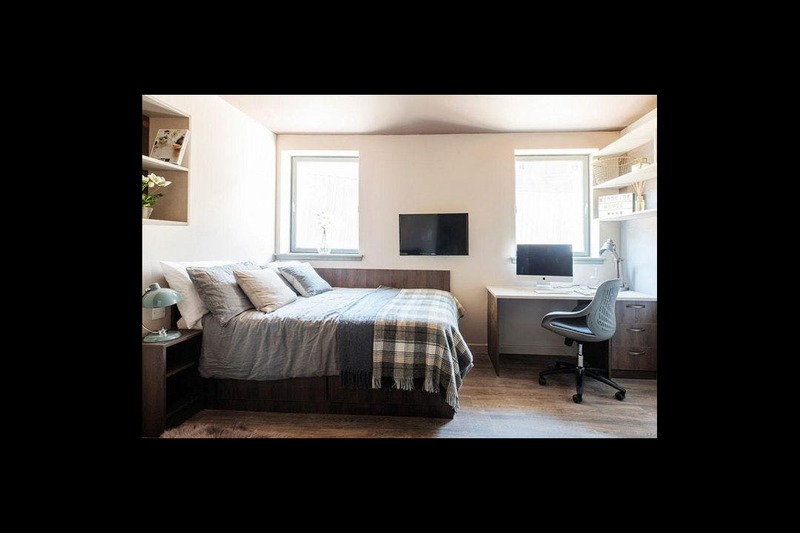 o All rooms at Gibson Street student accommodation are fully furnished with a comfortable bed, great storage, study station, and personal en-suite showers. o In the case of shared flats, students will be sharing the kitchen and living area with the other flat mates and it is great for socializing. o There are study rooms as well where one can sit down with their friends and work on their presentation together. o Students can find bike storage at Gibson Street student accommodation.  Glasgow Caledonian University is 2 kilometers away.  Glasgow school of Art is also around 1.32 kilometers away.  University of Glasgow is at a distance of 0.5 kilometer.  University of Strathclyde is 2.6 kilometers away. Buchanan view is not only cheap but also among one of the best value for money en-suite accommodations in terms of amenities. It costs around £119 - £189/week and fairly consists of all the facilities imperative for students. Vita Student is one of the most sumptuous off campus accommodations available for students. It is relatively expensive, but is one of the best value for money accommodations for the students with high accommodation budget. Glasgow is a brand new and lavish student accommodation nestled in Glasgow’s West End. One will be not more than 15 minutes from the city center and the university campuses. o The accommodations are inclusive of smart TV, complimentary grab-and-go breakfast all weekdays, 24x7 gym, complimentary bedding and kitchen pack upon arrival with weekly cleaning. o All rooms come fully furnished with the highest standard of furniture. o One will have their own personal bed, living space, study station, fully fitted kitchenette and a personal shower. o When one arrives at the property one will find high-quality bedding pack and kitchen pack with cutlery, plates and all the utensils you need to get you started. All this, compliments of the management team. o If one is not a morning person and always running late to lectures, then one will appreciate the grab-and-go breakfast bar, the management puts it together each morning so that one does not skip their most important meal of the day.  Glasgow Caledonian University is 3.6 kilometers away.  Glasgow school of Art is 2.8 kilometers away.  University of Glasgow is 1.3 kilometers away.  University of Strathclyde is 4.16 kilometers away.  Royal Conservatoire is 3.2 kilometers away. Vita Student is among one of the most deluxe and lavish accommodations. It is also among one of the most optimum value for money accommodations for students with high accommodation budget. It costs around £179 - £260/week and is well furnished and consists of almost all the facilities vital for students living abroad. Woodside House provides the most premium interiors out of the whole lot of options. It is a brand new, purpose built building offering the most luxurious and exciting student accommodation in Glasgow. Set in a leafy area in Glasgow’s, the stylish apartments and exclusive features are ideal for the city’s most discerning students. With just 91 en-suite studio apartments and a range of exceptional communal features, Woodside House is tipped to be one of Glasgow’s most in-demand properties this year. 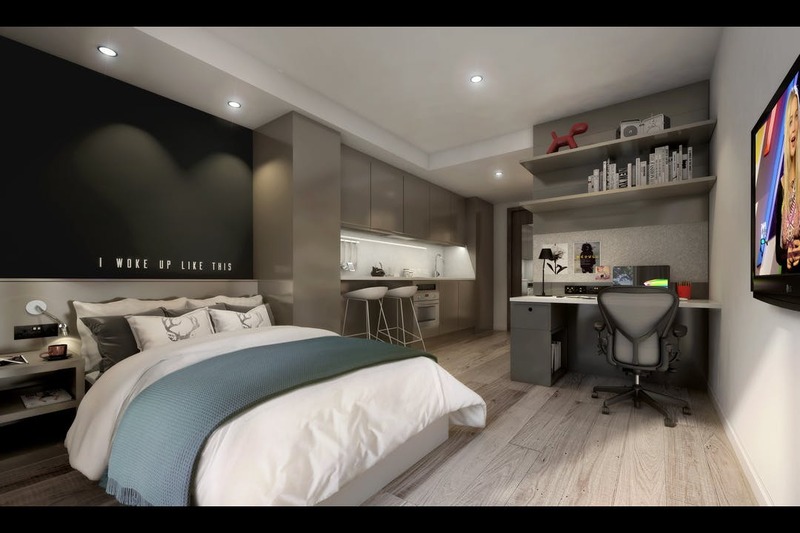 Students looking for the ultimate lifestyle experience need look no further than Woodside House. o The property also boasts individual study rooms, communal study rooms and TV snugs. o An en-suite bathroom, storage space and a fully equipped designer kitchen. 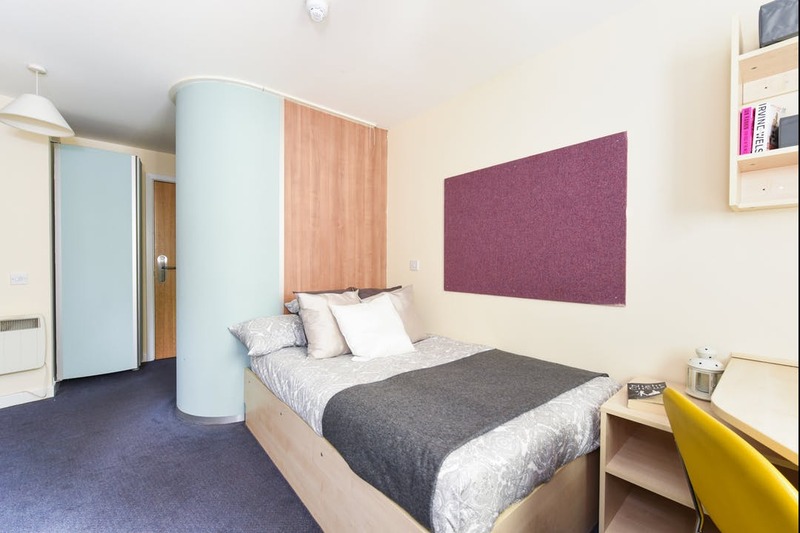 o All rooms at Woodside House student accommodation are fully and sophisticatedly furnished to ensure that you have the ultimate student experience. o All rooms have been tastefully decorated and with high finish meaning so that one gets to relax at home in some serious style. One can also come home to watching your favorite shows on your personal TV.  Glasgow school of art is 1.02 kilometers away.  University of Glasgow is 1 kilometer away.  University of Strathclyde is 2.3 kilometers away. Havannah House is the most premium in terms of comfort and location. Ione can opt for either shared or studio apartment and enjoy world-class facilities such as on-site cinema room, fully equipped gym, communal study room. There is also MSCP public car parking right across the road and not to forget the vending machines. 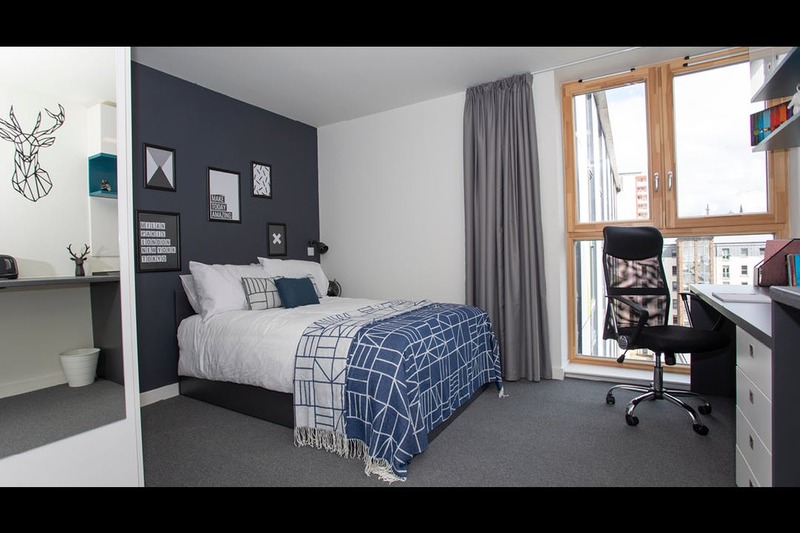 o All rooms at Havannah House student accommodation are well furnished and intelligently designed to ensure that you have an extremely comfortable stay and can focus on your studies without any distraction. o The rooms one will find are well furnished with a comfortable bed, study space, great storage solution and come with a personal bathroom. o The apartment also features a fully fitted kitchen and a comfortably furnished lounge. o The apartment also consists of a games room as well. We have covered all the vital aspects of these accommodations for your ease and uber comfort. We hope you choose the accommodation that suits you the best.